It peeked its head out just a day ago by way of a Korean back-to-school catalog, and now Samsung's ready to let its kid-friendly cat out of the bag. The Galaxy Tab 3 Kids is, as the name implies, aimed at ever more tech savvy young ones, featuring a child-friendly skinned Android 4.1 and a slew of educational apps, games, e-books and the like -- in fact, the more we hear about it, the more we think of the XO Tablet. Over on the hardware side, there's a seven-inch 1024 x 600 display, a 1.2GHz dual-core processor, front and rear facing cameras and 8GB of internal storage, expandable via a microSD slot. It's also got a rugged frame for clumsy little hands. The Tab is coming to Korea next month, with availability following in the US, UK, Europe, China and Africa. No word yet on pricing. Samsung Electronics today announced the Samsung Galaxy Tab 3 Kids, a tablet built specifically for kids with the educational tools and safety features parents want. "It's no secret that kids are using technology more than ever before," said JK Shin, CEO and Head of IT & Mobile Communication at Samsung Electronics. "We saw an opportunity to create a device just for kids that provides them with an intuitive, fun and kid-friendly user experience filled with rich, interactive and educational content that parents will love." The Samsung Galaxy Tab 3 Kids comes pre-loaded with top ranked kids' apps and a brand new Kid's Store aimed at driving the educational possibilities of technology for kids. Pre-loaded content includes educational, games, entertainment and e-book apps. The tablet also offers parents the ability to select the apps they want their kids to have access to using the Application Manager. Developed with kids' best interests at the forefront, Samsung Galaxy Tab 3 Kids also includes a Time Management feature that allows parents to set specific time periods for use. When the designated use time is up, a password protected lock screen appears, requiring a parent or adult to enter the password to unlock the device. This tool will help parents ensure the time their children spend on smart devices is balanced. With 1.2GHz dual processor, 1GB RAM, 3 megapixel front-facing camera and 1.3 megapixel rear-facing camera, Samsung Galaxy Tab 3 Kids has the power and performance you would expect from a Samsung Galaxy tablet, designed to provide kids with an exciting, interactive experience. 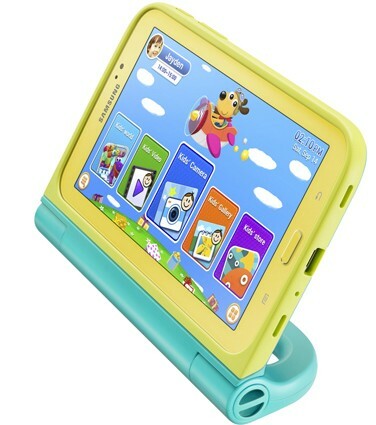 A Kids Case featuring a child-friendly grip and multiple stand options will also be available for the Samsung Galaxy Tab 3 Kids. The case also comes equipped with an easy-to-grip C Pen, providing fun drawing capabilities without the possibility of leaving marks on other objects. The Samsung Galaxy Tab 3 Kids will be available in Korea in early September and subsequently available across China, Europe, U.S., Africa, South America and South East Asia. The availability of applications through Kids Samsung Apps will vary by market. UK availability will be announced in due course.